There is a soft, damp quality to the air as I emerge from the cave, and wisps of mist obscure the whole area in front of my home. Closer to the edge of the wide, shallow bowl that is this mountain ledge, I see that the forests below are almost invisible because of the mist that lies more thickly further down the mountain. Only the tips of the tallest pines are visible. Lower down, I know that the broad leaf trees are changing their coats but I cannot see them. The fire has been set ready the night before, and I use flint and steel to make sparks to kindle a handful of dry leaves and resinous pine needles and twigs I have brought from the store deep in the cave. Long practice means it takes only half a dozen strikes before a cascade of white-hot sparkling dots falls into the mass of kindling. Flowers of fire spring up and before long, the bonfire is crackling. Along with the smell of the smoke, the air is filled with the rich, spicy scents of autumn. Dying leaves, ripe fruit, the peppery aroma of edible fungi, and the comforting smell of resin from my woodpile, all the fragrances I love and associate with the time of preparation. I sit down, on one of the low benches I have fashioned from logs, and warm my hands at the rising flames. I eat an apple, slowly and thoughtfully. Its perfect skin is unblemished and the flesh is tart yet sweet. 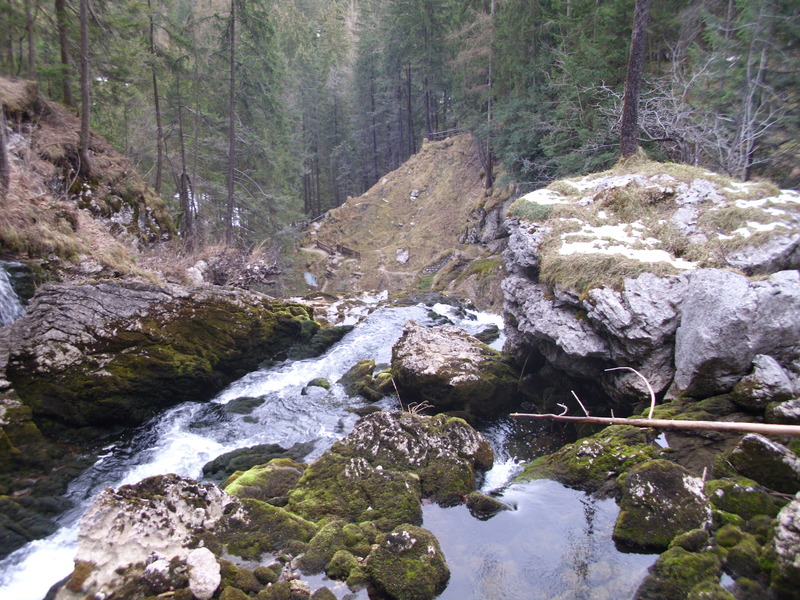 Birdsong fills the air, and the sound also of the mountain spring that supplies my water, bubbling up and falling away into a streamlet that rushes down the mountainside, gathering momentum and rainfall as it goes. Somewhere deep in the forest it becomes a river, swelling and growing and wearing a path through rock and earth alike. The sun has risen and is hanging like a golden globe above the white mass of fog, its face veiled still as if the finest of silks had been draped over its radiant visage. The mist will burn off soon; indeed, I can see the forms of the taller broad-leaves emerging now from the swirling whiteness. Their colours are poised between the green of summer and the buffs, golds and crimsons of autumn. Before too long even those brilliant colours will be swept away by the winds of winter. For winter is coming, make no mistake. This day is a day of inventory, of assessing my stores and perhaps deciding I have more time to gather in more food for thought as well as food for my body. Fuel of varying kinds have been stacked up, from the elaborately constructed pyramids of fire wood to the rendered fats for lamps and tapers, and the precious beeswax, scented with honey and propolis, and the pages of a hundred books, stored close to the fire for dryness, to fuel my mind during the days and nights of raging blizzards. Winter is a time to nurture the deep thought that comes with the immobility that ice and cold and snow and wildness bring me. The sun has revealed the forest now, so I stand and go to the edge of my little domain, and look down upon it. A thousand shades of green are giving way to other shades now, but for the moment they are about equal, as are day and night. Soon night will overcome and long dark days will follow. Yet I know that however long the winter may be, spring always comes, sooner or later, and I throw my apple core as far as I can, with a silent prayer that its pips may become more apple trees to feed and beautify the denizens of this forest I love so much. You are on a woodland path beneath a canopy of trees in full but fresh leaf. The path is soft and sandy but every two feet or so, there is a large flat stone that lies set into the soil like a stepping stone in a river. Like a river, the path winds in a leisurely fashion and takes you forward without rushing. There is birdsong all around and the breeze is pleasantly warm yet refreshing. Above the canopy, the sky is a deep, restful blue, with a few pure white clouds that move like slow ships across the ocean of sky. The trees ahead form a tighter tunnel that then opens into a green archway and beyond it there is a clearing. At the centre of the clearing is a wide pool of water, the margins of which are marked by more of the large flat stones. Unlike the ones within the wood, these are speckled with lichen and mosses and ferns grow between them. At the far side of the pool the water spills over into a fast-moving stream, suggesting that the pool is fed by a spring. Walk closer to the water and find somewhere to sit. The ground near the pool is soft and comfortable, plump with moss and deep, thick grass. Once you are seated, try and look into the water. Let your eyes sink into the cool green depths, and see that amid the water-weeds, little fishes dart hither and thither. Some are bright silver and others are golden. Their movements are like flickering flames at the bed of the pool. What else can you see down here? Bubbles rise from time to time, strings of minute silvery beads that burst as they reach the surface. Now and again, a larger fish rises, breaches the surface with a soft ‘pop’ and dives back down. Dragonflies hover, jewel-like, above the water. A few water lilies bloom, and on the margins other wild plants flower. There is a scent of mint from the water-mint that seems to grow everywhere. The air is filled with the small sounds of nature, from bees to birds and behind it all, the song of the stream as it rushes over its pebbled bed. Though there are no man-made symbols, you know without a doubt that this is a sacred, beautiful place and you are blessed by being here. Sit awhile to let the blessing sink in, gazing on the reflection of the sky and the trees in the mirror-like water. When you are filled with the peace of this place, dip your hands into the water and bathe your face with it. Cool, but not cold, it wipes away any weariness of soul and refreshes you for your return to the world beyond the sacred pool. There are cobwebs everywhere when I move through from the long dark tunnel and into the subdued light of the cave. At first I think this is simply because it’s been so long since I’ve been here but as I look around, I realise that the place is different from when I was last here. The light streaming into the cave has a mellow, golden tone to it, and the air smells not of sap and spring flowers but of wood-smoke and that spicy, musky odour of fallen leaves. When I get to the entrance, I see there are things waiting for me; this is always the way: I arrive and I find that something has been prepared for me. In the brisk wind, I see Reindeer waiting at the fire-pit, the breeze ruffling dense fur. I bow my greeting before burying my face in that soft warm fur. It has been too long and I am ashamed of my absence. I had felt unworthy to come here, laden and burdened with anger and a desire to hurt those who had hurt me, so my visits stopped. I did not wish to pollute this sacred space with my pain, though surely I should have known it would heal me to be here. I am a fool. I feel a touch and I look up; the great soft muzzle has nudged me to alertness and with one unmistakable gesture I am directed to investigate the things left at the entrance. I get to my feet but as I move, I sense Reindeer getting up and moving away. The pile of objects left for me are puzzling and delightful. The first is a heap of pebbles, white quartzite polished to a sheen, each so large I cannot close my fingers around it. They are heaped upon a folded blanket of crimson and other colours. There is a design woven into it but I cannot interpret the figure in the middle. The wool is dense and soft and will be very warm. The final item is a long plush feather, barred in beige and white; by the feel I think it may be from an owl. I am alone. My guardian spirit is close by and I know I am safe as the sun dips below the horizon, far off beyond the endless forest that stretches out below my ledge. I set to and light the fire, feeding it with the pine cones that litter the pure white sand around me. One by one, as the sky turns darker, the stars emerge, pinpoints of brilliant white light in a velvet canopy. The night is cool, and is becoming colder, so I fetch the blanket and wrap myself in it and I sit close to the fire. My head nods and I have to stop myself falling into a dream state. Perhaps I have for as I gaze into the fire, I see eyes gazing back at me from the other side of the fire-pit. At first I think my guardian has returned but then I see that there are not two eyes but eight that watch me, without blinking. In the dancing shadows I see that my new companion is a being that baffles all comprehension. As the light flickers, she too flickers, changing from one form to another. At one moment she is a an elderly woman, her face stern and wise and webbed by lines of experience that make her visage more beautiful than a smooth young face could be. At another moment I see a vast Spider, lovely but alien and strange. Perhaps I should be afraid but I am not; instead I am simply overwhelmed with the honour of this visitor. “Greetings, Grandmother,” I say, bowing, even though I sit cross-legged and swathed in my blanket. She bows back and we sit, facing each other through the fire, companionable but silent. I do not know what to say and I wait for her to speak. As my Elder, she must have come with a message, but for a long while she sits, her hands moving but her voice stilled. Gradually I see that she is weaving, or perhaps knitting, and her clever fingers are creating something out of yarn. The night draws on and I am glad of the fire. My legs grow stiff, and reluctantly I get to my feet to stretch them. Her voice is melodic and sweet, but it makes me jump because I had begun to think she would not speak at all. Bringing a few at a time, I carry all the pebbles to the fire side and when I offer to bring them to her, she shakes her head. She had settled on form and much of me is relieved that she has chosen to remain as Grandmother, leaving her Spider form. I settle down again and look at her, quizzically. “Build me a tower with the stones,” she asks. The stones are too rounded, surely, but I obey and time and time again, I manage to balance one pebble on another, and sometimes even a third, yet always, the fourth one’s placing causes the tower to tumble. She laughs, as a mother might at a child’s folly. I drop the stones and lower my head, feeling my cheeks redden and I struggle to force the anger down again. “I can,” she says, and when I glare at her, my eyes filled with skepticism and anger, she laughs again. “Show me,” I ask, ruder than I ought to be to this Being. She comes to my side of the fire and I see that she has been weaving a long, thin net. She picks each stone very carefully slides it into the net until it is full and all the stones are contained within it. She holds the end of the net, and the stones jostle for a moment before settling. She laughs and very slowly removes her grip on the net. To my astonishment, the structure remains upright and intact. For about ten seconds, it stands before toppling to one side. Some of the stones spill out. I am chastened. I do not ask her why she asked me to build an impossible tower, but instead I gather the stones and the net back together and I hold two of the pebbles, one in each hand. They are of the same weight and size and the cool surface of each is a pleasure to touch. I do not understand but I do not really need to; this is something to ponder in the long nights to come. The stars have shifted since I first began my vigil and I sense that we have come to that still point, where for a short time, day and night are of equal length before inexorably, night becomes longer and the days brief and cold. I take the two stones, and I manage to balance one upon the other, and I leave them by the side of the fire-pit. The Being on the other side stands up, her body filled with grace and strength that bely her ancient nature. She raises a hand and in my mind, I also see her raise palps and she slips away down the trail that begins at the edge of the sand. I sit back down and wait for the dawn. I slip into sleep, and I wake to find Reindeer next to me, my head resting on warm flanks. All around the cave, all over the bushes at the edge of the ledge, are a million webs shining with jewels of dew. The blanket slides off my shoulders as I rise to my feet to stretch, and as I pick it up off the sand to fold it, I see clearly for the first time the design woven into the wool. A stylised spider sits at the centre of a web whose threads make the words: Grandmother Spider Wove The World. As I walk back into the cave, I find the feather. I had forgotten this gift and as I lift it to the morning light, I see that the end of the feather is shaped; the hard keratin end has been fashioned into a nib. “I have no ink,” I say aloud, but Reindeer is asleep and there is no one to answer me. 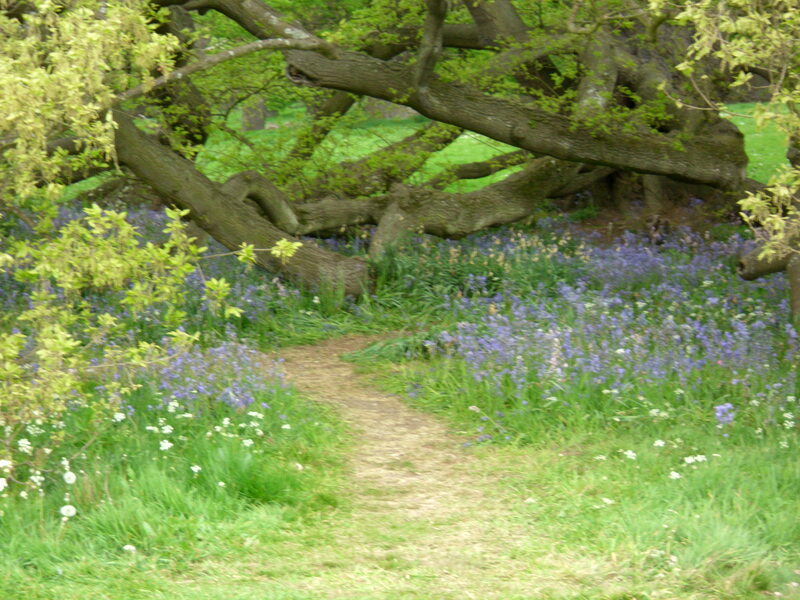 Bluebells are one of the most quintessentially English of wild-flowers. The sight of a woodland floor carpeted in bluebells as far as the eye can see is a delightful and uplifting one. Curiously, the flower known as bluebell in England is not known by the same name in Scotland, where it is referred to as the wild hyacinth, echoing the French name, jacinth sauvage. This gives clues to the flower’s family connections and also to it’s glorious perfume. This year, the bluebells have been almost a month late flowering and are now at their peak. I cut a small number from the garden to put in vases round the house so we might enjoy their colour and fragrance indoors since the weather has been cold and rainy. If you have access to garden bluebells, cut a few stems to place in water; native English bluebells, like all wild-flowers, should not be picked or dug up. You may also use hyacinths for this meditation or essential oil of hyacinth (which is expensive but heady and almost hypnotic) Find somewhere to sit where you will be undisturbed and calm and centre yourself. If you have a recording of woodland birdsong for an English spring, that may also aid the deepening of the meditative experience. If you have some bluebells with you, gaze at them for a few moments, drinking in their colour, form and scent. Then, when you have fixed them in your mind, close your eyes and begin to relax. You are standing at a woodland edge. It’s spring, early in the morning but well past dawn. The birds have finished their hymn to the new day and everything is settling into its daily pattern. The sun is out, and it’s occasionally lost behind fluffy white clouds that meander slowly across a sky that is a beautiful shade of blue. There’s a freshness to the air that tells you that spring has a long way to go before it becomes summer. The trees at the woodland edge are tall old oaks, and their new leaves are still small, not fully opened, and a pale luminous green that is transparent and moist. The path into the wood is no more than a thread of beaten earth, made by passing feet and followed also by deer and rabbits and other creatures. Here and there, in patches of mud you can see their tracks where a single fleeting hoof has splashed through a shallow puddle. As you enter the woodland, the light changes and so too does the sound. Both become muted by the canopy of trees. You can see the blueness of the sky above through gaps in the canopy, and the newly opened leaves are still allowing light to shine through them. The air seems to shimmer with this light green light and you find this very soothing as you stroll along the path as it winds among the trees. There are some giant old oaks here, some struck by lightning and others just huge shells with tufts of new leaves. It feels safe and friendly here so you continue onwards. The path becomes less muddy, and you can see that it’s streaked with pale sand now where the rain has drawn particles to the surface. It weaves through the trees, as the woodland rolls gently up and down. Sometimes the path seems to take a steeper route and you sense you are being led higher, though the way seems to wind and double back on itself. It feels leisurely and you are not in a hurry so are content to follow the path. Here and there birds sing as you pass, but there is no sign of other people around. It’s supremely peaceful here and you feel happy and at ease with yourself. As the path leads steeply upwards you feel a sense of excitement building, and as the slope becomes sharper and your breath comes in gasps, you feel sure this is leading to something amazing. After a few minutes of hard climbing, you reach the top quite suddenly and you stop in your tracks in wonder. The top of the hill is flat, covered in a grove of the most lovely trees, but the earth is lost beneath an expanse of the most heavenly of blues. Bluebells in great profusion cover the forest floor. The scent that washes off them in the gentle breeze almost overwhelms your senses and you take a deep breath, drawing the fragrant air far down into your lungs, holding it there so you can almost taste the bluebells. You stand at the edge of the grove, wanting to go further in but afraid to trample on this profusion of beauty, till you see that the path continues to wind on, just wide enough for you to walk on it. The shining leaves of the bluebells caress your ankles as you walk, and the scent rises, smoky and sweet, at every step. The path takes you to the middle of the grove where a single young oak tree waits. No more than perhaps thirty of forty years old, this tree is still small compared with the giants around but it has a special look to it, and when you get to it, you see that beneath it is a large flat boulder, with has a kind of basin in it. The basin is filled with water and a single floret of bluebell. Around the boulder is soft white sand, and so you sit down on it. Looking upwards the new green leaves of the trees make a pattern of great loveliness with the blue sky beyond them. All around the deep blue of the flowers, the glossy dark green of their leaves, and the verdant oak leaves fill you with the powerful peace that can be found in woodlands. Touch the water. See the ripples and the changing reflections shatter and reform. Touch the flower head. It feels fleshy and cool, and for something so ephemeral and fleeting it feels stronger than you would expect. This is the power of bluebells. Each year they bloom for a few short weeks, then disappear back under the earth. Yet even while they are invisible, they are growing, spreading and colonising new lands. Left alone, they will return year after year to raise their heads to the blue sky above. Gaze at the bluebells. Feel the calmness their colour and scent bring to any troubles you may have. Stay as long as you wish. This is a safe, nurturing environment and you will know when it is time to leave. The sun has risen high in the sky now and you feel the warmth reaching you here on the forest floor. The duties and joys of the day ahead await you. You can retrace your path to the woodland edge or you can follow the path onward. Once it dips over the other side of the grove, it takes a shorter route back to your world. It’s up to you which you take. If you want a longer walk to think about what you have experienced, take the original path back. If you are ready now to return, take the quicker path back. Once you reach the woodland’s edge, stop for a moment and look back at the trees and remember how good it felt to be at peace in such a wood. Now let the forest melt away and let yourself return fully to your normal world. Take a few minutes to record your experiences and also make sure you have a drink of water to help you ground fully. I’ve been struggling with my health recently. I realised a few days ago that what I’d been feeling for months was a sort of numb nothingness that spilled over into unwarranted sadness over the strangest things. My inability to crack on with tasks that are simple and easy was meaning that I was procrastinating about lots of things I ought to have been expediting. I needed to make an appointment to see a rheumatologist, and it took me longer than it ought to pick up the phone and set things in motion. But the blank lack of much real feeling became evident a few days ago when someone asked me, “You must be excited about the new book coming out?” and it came to me that I felt almost nothing. I thought lots of things, but there was a big question mark over how I was feeling. I’m living a different life to the one I lived a year ago. I’m at home far more. I am still trying to find my feet in a new place, having been unable to get out and explore as much due to the persistently cold, damp and miserable weather. I’m getting to know a new garden, and I’m finding it hard. Every bit of gardening I do causes me to hurt in unprecedented ways. It’s frustrating. I want to garden but I lack the physical strength to do much. We bought a bench the other week. A nice, slightly ornamental bench that sits now under a natural arbour of a tree I suspect may be a cherry plum, between two trellises of roses and jasmine and honeysuckle. I’ve put up a single line of solar powered fairy lights, and hung out some glass tea light holders so when the nights are pleasant enough we can sit out and enjoy the evenings. I’ve planted seeds for night-scented stocks and other plants who release scents after dark. It looks lovely, and I’ve been sitting there to meditate most days. We bought goldfish for our pond too, and combined with our bees, the garden is beginning to feel like an oasis away from the world beyond the fence. I even dug up an ancient key when I was preparing the vegetable patch, reminding me of The Secret Garden. When I go places, for work or not, I’ve begun to collect a mental map of peaceful places in each of the locations I visit. Some are well known parks and gardens. Some are cafés and tea rooms with hidden gardens. Yesterday I went to one of my special places in Norwich. At the end of Elm Hill, a medieval cobbled street preserved from destruction by a forward thinking council in the 1920s, there is the Briton’s Arms. It was used as the inn The Slaughtered Prince in the film Stardust (which was filmed partly in Norwich) and is a lovely building, all half timbered and quirky. They also have a secret garden, tucked away at the back. Great pots of ferns and of palms and many tubs and baskets create the feeling of a clearing in a jungle. One wall is composed of ancient gravestones propped up at the far end of the churchyard beyond. (Norwich has the most medieval churches of any city in western Europe; there are, I think 33 within the city walls). It’s a little oasis of peace and tranquility that does wonderful home-made cakes too. I sat and read out there for forty five minutes, enjoying my tea and cake. I read Margaret Coles The Greening, a novel which is set partly in Norwich and explores the story of Julian of Norwich, one of my heroines, as well as the story of two other women who became fascinated by Julian. It’s an enjoyable if slightly flawed novel but it felt perfect to be reading the first half there. When we released the goldfish into their new pond, I realised I was that tiny bit closer to achieving some long standing dreams of creating a place of great peace, hidden away from the world, private and refreshing. I first began this dream 22 years ago, when we visited Taizé and I spent time at the Chapel of the Wellspring there. On two occasions since then, we have looked at places we might have gone to live that had healing wellsprings, both quite famous in their ways, and we’ve said no to both. Later we have discovered that there had been rifts in those communities concerning the springs and the churches and it has confirmed our instincts that however much we both wanted to be near those springs, it wasn’t right. I’ve never given up hope that one day I may be guardian to a wellspring but I’ve begun to understand that the definition of what a wellspring is may be subject to quite different forces than those of a dictionary. I was chatting with Madison Woods on Facebook the other day, and discussing a post she’d written about the three kinds of music. And the fourth kind. “Instrumental music is the music most people will think of when the word ‘music’ is used. It’s the kind you hear with your ears and tap your foot or sing along with. Music of the spheres is the sound emitted by celestial bodies as they move through space. I have heard of this and even listened to recordings made from outer space, but it wasn’t something I’d connected with when I first heard about it. Music of humans is the musical harmony between the souls of humans. It is this one that struck the chord with me when I heard about it for the first time this morning. This music between souls of humans explains a lot about why some people just don’t get along from the get-go, and why some click and resonate so well from the very first time they meet. It adds to the explanation of the phenomenon of soul-mates. Until I met Rob, I didn’t believe in soul-mates, by the way, so I’m a relatively newly converted believer. And now I remember how this had to do with the marketing. It is from this place of harmonic resonance that the connections between people arise to make the kind of marketing Lynn talks about in her book possible. It’s about forming communities and tribes (a well-used, maybe over-used, buzz word in the online social marketing arena) of others who share your world-views. Its not necessarily about forming mono-cultures of those who are pursuing the same goals as us (i.e. writers grouping with writers… satisfying on a personal level, but perhaps not a good marketing strategy). In a village full of bakers, who’s going to shoe the horses or till the ground? I confess it brought up some powerful thoughts in me, because I knew exactly what she was talking about. It’s almost impossible to describe in ordinary terms and for those who are sceptics, then I suspect you have plenty of explanations for what I have felt and heard. The best way to illustrate it is via my own fiction; the following are two excerpts from The Bet, where the main character is trying to understand a number of things about his life and is sent on a long walk on the North York moors to try and get his thoughts straight. “So he walked, obediently, and found himself getting higher and higher into the hills and this breathtaking silence and crystalline air. When he’d gone as far as he dared and still be able to get back before dark, he stopped. He was on open moorland, scarcely a tree in sight save low scrubby birch and rowan. There was snow on the ground up here, frozen hard and untouched by the bright winter sun, and the sky was like an immense dome of icy blue glass. He felt as though he could almost touch the sky; it seemed so close and solid. Tufts of heather showed black through the snow here and there, and large grey boulders, lichen-stained and worn by weather littered the ground. His breath hung around him in white clouds, and he could feel the sweat from the steep climb drying and cooling on his skin. There was a curlew calling somewhere, but he couldn’t see it however hard he tried. He cleared a rock of snow and sat down cautiously and let his breathing slow and quieten till all he could hear was this great empty moorland. There were lots of small sounds, once he was himself quiet enough to hear them. A thrush was breaking open a snail, halfway down the valley it must have been but the sound of shell on stone reached him so clearly it could have been only a few feet away, such was the clarity of sound. A grouse clattered somewhere behind him; its call of “go back go back”, reminding him he would need to turn round and go back soon. After he had sat for some time, he fancied he could hear something beyond the small noises of animal and bird life, or the occasional aeroplane, or distant car, or even the soft soughing of the wind among the heather and stones; a kind of gigantic pulse, soft and deep and very slow. He was aware he had got very cold, that his bum had become numb with sitting on the cold unyielding rock, but still he listened, entranced. During much of my life, I have been able to still myself and feel that giant in-breath and out-breath, that deep, silent pulse of life, often up on mountainsides or by the ocean at twilight. I’ve been able to feel it in a busy London park, hearing the sublime, silent songs of the beds of flowers and the towering plane trees. I’ve been able to hold a wild mouse in the palm of my hand, meet the minute eyes and hear the song of that little creature. Many times I have pressed by ear to the trunk of a spring-time silver birch and beneath the river of rushing sap I have heard the voice of the tree itself. I’ve sat in Quaker Meeting and felt and heard the collective song of the community, humming softly beneath the sound of ticking clocks, rasping breath and gurgling stomachs. But lately I feel as if I have gone profoundly deaf. Worse, as if the song never existed and that I have been deluded to think it did. Yet reading Madison’s post reminded me that if I am deluded, then not only is she also deluded but vast numbers of people have also been, and I feel a measure of comfort. I have no answers to this yet, beyond the knowledge that the disconnection and disorientation I feel may be just a part of the journey, a passage through silence and perhaps into a deeper faith and a deeper relationship with the mystery that is life.